Every team played a total of 5 regular season games at the 2013 BSC. The 6 teams with the best records advanced to the playoffs. Scroll down for a more complete recap. The teams shaded in orange are the winning teams. "Thanks". "You're Welcome". The 2013 BSC Champions: DCZ FINEST! 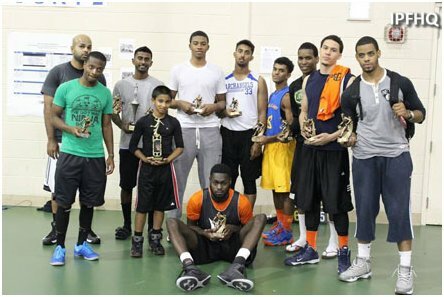 Full BSC Tournament Recap - Congrats to DCZ FINEST who win their BSC Record 4th Championship! A. The 11th Annual Blessan Samuel Classic is in the books! Congrats to DCZ Finest on winning a BSC record 4 championships. GAME OF THE YEAR: Brooklyn vs Toronto - BSC Opener. It's a rare occurrence when the opening game of a tournament turns out to be the game of the year but this matchup of last year's championship turned out to be that way. The game went to Overtime and Toronto showed they were here to stay. Shout outs: I want to take this time to shout out the following people. Without their help, this event could not have happened. Jenet Poopalan, Andrew Samkutty, Crystal George, Charles Thomas, Calvin Thomas, Binu Varughese, Vinod Varghese, Ajith Kumar, Michael George, Melvin George, Emmanuel Gratz, Mathew Baldwin, Josiah Harris, Les John, Greg Smith, Godwin Gabriel. To anyone I missed, many thanks for you're support. Special thanks to Justin George of the Toronto Archangels for writing up the following team by team breakdowns for 2013! DC: What more can be said? They are the four-time champs; a feat that has never been accomplished by any other team in BSC history. Missing a solid big man last year definitely hurt them, but with the return of David Kadiri aka Big Baby, that inside presence was felt by every team. With Jarvis leading his troops and Alvin and Justin dropping those timely threes, it all came together for them. Going undefeated and winning their fourth championship makes them a dynasty. The team to stop them from getting their fifth in 2014 is still up in the air. Philly: The Ballaz continue to be slept on and they continue to give teams a rude awakening. Though they are the oldest team in the tournament, their chemistry and basketball IQ are the reasons why they win! The addition of all-star, Vinil Abraham, improved their perimeter game. They simply outsmarted the more athletic Archangels in the semis to reach the finals where they eventually lost to DC. While their days seem numbered, something tells me they are not looking to slow down to get that coveted championship. Toronto: Another strong year from this talented team! They were the only team that made DC work for their win with a mere three-point loss to the eventual champs in the regular season. With a 2012 finals appearance, many thought this team would make it to the finals again, but Philly had other plans. While it was a disappointing year for them, they produced three all stars in Terrill, Shane, and Andrew. Terrill provided the crowd with an epic three-point competition by dethroning Justin Thomas for the title. Hopefully with a healthy return of their floor general, Shannon, they will make 2014 a memorable tournament. Brooklyn: After a tough overtime loss to Toronto at commencement of the tournament, Brooklyn looked determined to bounce back. The lack of a bench the first day may have made them struggle but their all stars, Vincent, Jabbar, and Jordan, shined bright. With a strong showing versus Strong Island in the playoffs, they looked to ride that momentum against DC, but ran into trouble from start of the semifinals. Still, last year’s champs cannot be slept on! Look for them to come out stronger than ever in 2014. Strong Island: After a three-year hiatus, the return of this team with a totally revamped roster impressed many. They were in every game and even won the battle of New York against last year’s champs in the regular season. Led by their all-star point guard, Abel Abraham, solid shooting from the perimeter, and scrappy defense, their games were exciting to watch. The upside of this team is scary. All you veteran teams, watch your back for the Stunnaz have truly returned! Gburg: The inconsistency bug continues to plague this team. With the return of Owusu brothers at full health and a strong roster, many thought that this team would do some serious damage. Regardless of their showing, the individual highlight of Teddy’s all-star selection proved that his point guard abilities led the team in most of the games. Lanham: Congrats to the Legends for their first win in team history. Improvement was definitely seen this year especially in Calvin Thomas and David Singh. They have a very young squad that has plenty of potential to grow into a strong team. Keep practicing fellas! Montreal: Much respect is due to this team for not only making it out for the first time ever but also taking the long, long trip from up North. They had some close games but alas, their lack of bench depth hurt them. With the addition of a few more solid pieces next year, this team can make some noise. 2014 BSC - First look: As the BSC enters year number 12, DC is clearly the team to beat, however Toronto is biting right at their heels. Philly has proven that they aren't going anywhere, and Brooklyn, Strong Island, Gburg, Lanham and Montreal will be looking to take their game to the next level! Can't wait to see you there! Newark? Texas? Chicago? Let's go!! !